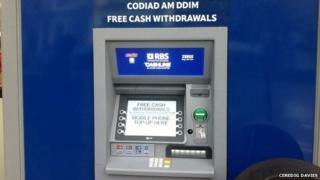 Tesco has removed a sign on a cash point machine after the Welsh version of "free withdrawals" was wrongly translated as "free erections". The mistake was spotted at the supermarket's Express store in Aberystwyth. Welsh-speaking councillor Ceredig Davies took a picture of the sign after hearing rumours about it around the town. Tesco said the correct translation will be put up as soon as possible. A spokesperson added: "Thanks to everyone who pointed out the mistake." The sign should have read "Arian am ddim" but instead it was "Codiad am ddim". Mr Davies said: "There were a few titters in the town so I went down to have a look myself. "Ten out of 10 to Tesco for considering the Welsh language. "But perhaps they should have had it checked by an actual Welsh speaker before putting the signs on the machines. "People get their Welsh translations wrong from time to time but this one is hilarious." Tesco: What should it do next?